I am so thrilled to begin my wedding blog series today. When planning this series, I knew without a doubt that I wanted to begin with a post about our ceremony: it’s the reason all of the other details exist. Our ceremony was the most important part of our wedding day, and I will always treasure the memory of promising my life to Grace with all of our family and friends as witnesses. We chose to have a traditional Episcopalian wedding ceremony, and our Priest and dear friend Rev. Ed Milkovich married us. 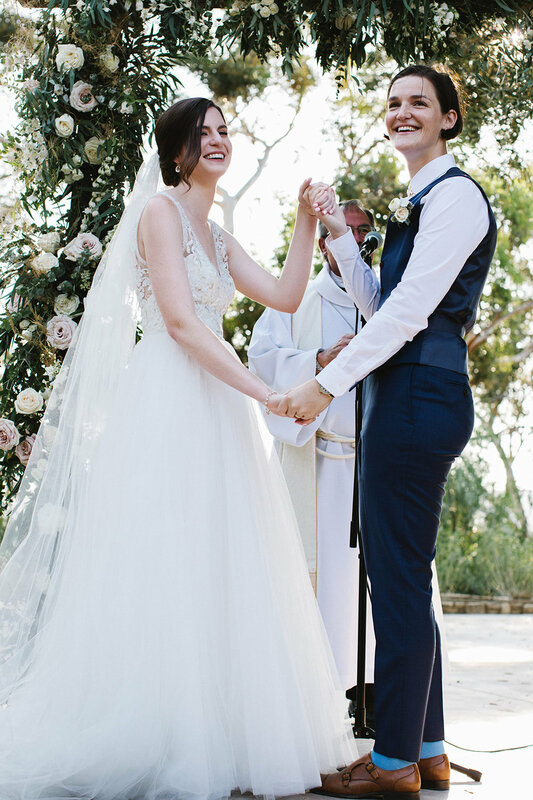 It was important to us that our wedding officiant was someone who knew us both, encouraged us in our faith and in our relationship, and would be in our lives after our wedding. We love Rev. Ed and are so happy he officiated. The morning of our wedding, he gifted each of us with beautiful rosaries that he made by hand, selecting special stones for them and writing out a prayer for us to read before walking down the aisle. During our ceremony we exchanged vows and rings, Rev. Ed said beautiful prayers over us, and our guests were invited to affirm and witness our marriage. We had a very large wedding party (we had 26 people to get down the aisle, between our 20 total bridesmaids, our 4 parents, and ourselves), which was so wonderful. Being surrounded by a 20-strong SQUAD up there as we said our vows was one of my favorite parts of the wedding. Grace’s bridesmaids (and men) processed first, followed by Grace walking down the aisle with both her parents, followed by my bridesmaids, with my sister (and maid of honor) going last, and then my brother escorted my mom to her seat, and then my dad and I walked down the aisle together last of all. As I’ll share more about in a future post, Grace and I chose not to see each other all day before I walked down the aisle to her (we did not do a “first look” before the ceremony), so the emotions were running high as we finally saw each other. It was a precious moment and I wouldn’t change a thing. Another meaningful part of the ceremony was when Rev. Ed joined our hands together and wrapped them in his Priests’s stole while he pronounced that we were now married. If you watched Meghan Markle and Prince Harry’s royal wedding, you might have noticed that Bishop Michael Curry did the same thing with their hands. It’s a special Episcopal tradition that I am so glad we included. We also had some of our close friends do readings and lead our guests in a prayer for our marriage. I’m so glad we were able to incorporate even more of our loved ones in this way, and we cried as each of our sweet friends came up for their readings. We had a reading from Romans that we both have always loved, a reading from the Willie Nelson song “Hands on the Wheel” (yes, our dog is also named Willie Nelson), and a traditional Episcopal prayers of the people reading. It was a hot summer day the day of our wedding, so we had handheld fans on each seat and parasols available at the beginning of the aisle for guests to grab. We also had little packs of flower petals on each seat for our guests to toss as we walked back down the aisle together as Grace and Elizabeth Baldridge. Hearing Rev. Ed say “you are now married and bound to each other as long as you both shall live” and walking out through a flurry of rose petals were two of the sweetest moments of the whole day. We headed back into the house to sign our marriage license and then take sunset portraits with our amazing photographers!